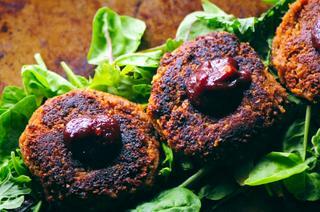 Healthy, easy, and delicious BBQ Chickpea Walnut Burgers. These hearty and filling vegan and gluten-free burgers can be pan-fried or grilled; and pack a most delightful flavorful punch! These Barbecue Chickpea Walnut Burgers make for one hearty, filling, easy, and delicious gluten-free & vegan meal . . .
Every once in a while I really crave something in patty-form that meets the heartiness level that my body needs at that time; and these Vegan BBQ Burgers made with chickpeas and walnuts certainly satisfies those cravings . . .
We fell in love with these veggie burgers from the get-go and I hope you do, too! In a food processor or high speed blender combine all of the above ingredientsBlend until relatively smooth & evenly combined, but with some bits of coarse texture still showing through.Cover and refrigerate your burger mixture for at least 1 hour.Divide your burger mixture into about 1/4 cup dollops.Shape into patties with your hands, wetting your fingers as needed if the mixture sticks at all.Heat a lightly greased skillet on the stove over medium heat or alternatively heat a grill to medium heat and let pre-heat about ten minutes.Grill each burger for about 4 minutes each side or until desired golden crispiness.Garnish with more BBQ sauce before serving.Enjoy!